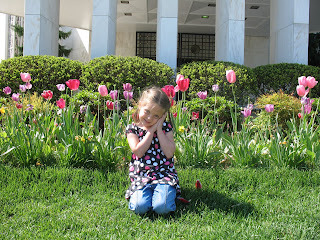 We couldn't leave the D.C. area without checking out this amazing temple. It is so beautiful! We walked all around and enjoyed the gorgeous scenery. The visitor center was open so we looked around inside. The girls were both very upset that we had to leave and I don't blame them. I'm so grateful for my wonderful, amazing husband for letting us tag along on his trip and for taking us to see all these great cities! 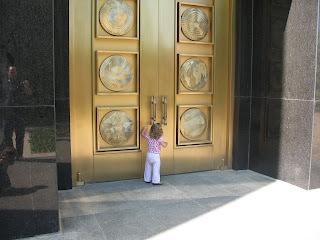 Love these pics...when I saw the ones at the DC Temple I teared up. 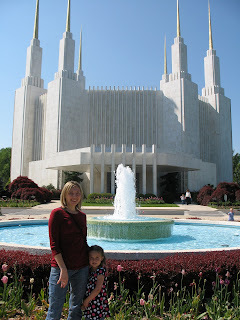 Bill and I were sealed there and I love that temple. I really miss the east coast. I'm glad you got to go visit there :) We missed y'all while you were away. That temple is so gorgeous!! What an awsome time you guys must of had! I am happy that you got to tag along with Dan- I love it when we get to tag along with Jeff! !